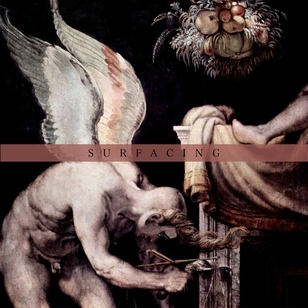 Surfacing is the startling self-titled debut album from this exciting Nottingham band. Across five tracks of crackling electronics and insistent beats it hints at presences beneath everyday perceptions: uncanny temporalities and violent becomings that threaten to disrupt life – the ‘horrors’ that society tries to suppress, but which will necessarily triumph one day. On the cover is Francesco Salviati’s depiction of karios readying his arrow. For the Greeks, kairos referred to the concept of eventful time: a time pregnant with all other times; a time that interrupts the linear flow of chronos. This feeling of boundless possibility in the present carries across to the album’s sonics, with Surfacing taking in rhythms from the dancehall to the Berlin wasteland; post-punk urgency; and moments of oblique beauty. ‘Surfacing (Susanna’s Song)’ opens the album with sharp, rhythmic stabs and a rumbling bassline, while wildly distorted vocals announce that ‘we’ll take back what’s always been ours’. Who this ‘we’ is remains unclear: the colonized? The dispossessed? Nature? The proletariat? The theme of imminence continues to ‘Hypocalypse’ which repeatedly asks the listener if they’ve ‘heard the news recently’ as ‘it’s so much louder than it used to be’. ‘Amaurot’ and ‘Melancholy of Fulfillment’ showcase Surfacing’s more melodic side – the latter a strange, alien tale of bodily abjection sung over a haunting pitch-bent vocal loop: “Like shrapnel I’ll remain/A memory and a ghost/To remind you of love”. ‘Her Smoke Rose Up Forever’, meanwhile, dares to hope: a triumphant riff emerging from eerie drones and desperate incantations before a rollicking finale reminiscent of F*ck Buttons at their most urgent. This is exciting, urgent music for uncertain times. Something is surfacing. Surfacing was made using Ableton Live, vocals, contact microphones, frying pan, samples, melodica, kalimba and Korg Monotron. It was mastered by Joe Caithness at Subsequent Mastering, Nottingham (Peverelist, Bass Clef, Soft Walls, Geiom).